In stock -This product will ship today if ordered within the next 9 hours and 3 minutes. Made with plant extracts and mineral salts, Salt of the Earth Deodorant is natural, soothing and effective, scented with lavender and vanilla. Fragranced with a fusion of over 15 natural botanical extract and oils, the lasting impression is a gorgeous lavender and vanilla fragrance that is fresh, floral and sweet – a great way to start off the day! 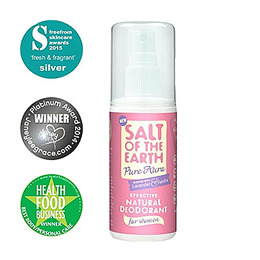 Salt of the Earth natural deodorants and crystal deodorants are powered by a natural mineral salt. This naturally deodorising active ingredient rests on the surface of your skin providing you with natural protection that lasts longer. 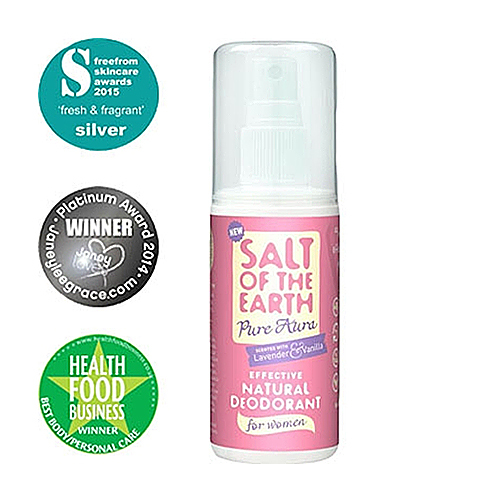 Salt of the Earth natural deodorant does not leave white marks on your clothes, like those often left by conventional deodorants and antiperspirants. Say goodbye to frantically washing white marks from your favourite black shirt, t-shirt or dress! Does not contain any animal derived ingredients, a great choice if you are vegetarian, vegan, or just don`t like the idea of animal ingredients in your deodorant. None of the Salt of the Earth products have been tested on animals, but have been tested on their customers over the past 20 years! Aqua, Potassium Alum, Polyglyceryl-10 Laurate, Aloe Barbadensis leaf juice, Lonicera Caprifolium (Honeysuckle) Flower Extract, Sclerotium gum, Parfum*, Lonicera Japonica (Honeysuckle) Flower Extract, P-anisic Acid (from star anis or Indian basil), Citric Acid,*linalool, *Limonene, *Geranoil, *Citronellol. * From natural essential oils and botanical extracts. Below are reviews of Salt of the Earth Natural Deodorant - Lavender - 100ml by bodykind customers. If you have tried this product we'd love to hear what you think so please leave a review. I've tried quite a few natural deodorants, this is the best one so far, effective, long-lasting and smells of sweeties. The best deodorant I've ever had! Effective, natural, no white marks...Great!! Love this deodorant! It’s safe, effective and smells lovely. I'm a repeat buyer. Great product. My go-to deodorant. The only aluminium-free natural one I've found that works and smells nice, too. Good to find a natural product that works well and has a lovely perfume. I love this product! It smells great, works really well, even when exercising. It lasts for ages, so it's also good value. A lovely scent, kind to sensitive skin. Very happy with this product. Best smelling natural deodorant. Excellent at keeping you smelling fresh all day. Kind to the skin and natural, perfect choice for anyone. Since finding this natural Deodorant I wouldn't use anything else. Have even got my granddaughter using it too. A lovely smell. The best cruelty-free deodorant I have found. Smells lovely! I love this product! Smells great, it works and it doesn't have any nasties in. Highly recommended. Love this. Smells lovely and works all day and not doing me any harm. I love this deodorant. It has a Lovely subtle fragrance and it lasts all day keeping odours at bay without unhealthily clogging pores. Perfect. I should have looked at the product details more carefully! So busy reading reviews - did not realise it was a spray - or I would not have bought it. However I gave to a friend who loves it. Seems to smell more like patchouli, which put me off at first, but I've carried on using it and now find the smell pleasant enough. In any case, I've never used salt deodorant before, but it works really well and has eliminated strong body odours even after heavy work or gym, so I'd definitely carry on using these products. Excellent deodorant, lasts all day, have tried a few natural ones but sadly they didn't work as well as I would have liked, Salt of the Earth works even when I go to the gym. No nasty chemicals and very quick delivery from this company. Great natural product, smells lovely and works very well too. Best deodorant I've ever owned. Very swift delivery by this company. I'll definitely buy from them again, thank you. I have been on the look out for a natural deodorant for ages and I am so glad to have found this. It smells divine and works. I'm hooked! Excellent product ! It doesn't assault my nostrils and lungs unlike the aerosol deodorants from the shop shelves! It does the job, and smells like you could eat it when you squirt it ! Wonderful product. Wanted a product without any chemicals which gave me protection and confidence. Drys quickly and doesn't leave white marks. Love this vegan friendly deodorant, it is my favourite and the best deodorant I have tried. Smells nice and lasts all day.